Goumba Johnny” Sialiano was born in the Bronx and entered into the radio industry after many career changes. Shortly after graduating with a Bachelor of Science Degree from SUNY (State University of New York at Brockport), Johnny signed as a free agent in professional football with the New York Jets and then with the New York Giants, also as a free agent. Although both opportunities were a dream for Johnny, he had to retire from the sport due to a neck injury. After his football career ended, Johnny put his 6-foot, 220-pound stature to use in a way not unlike the football field. He established “Broadway Bodyguards” and escorted celebrities and famous businessmen in and outside the New York City area such as, Smokey Robinson, Sam Kinison, and Malcolm Forbes. In the mid-eighties Johnny did character voices and wrote comedy bits for radio stations across the country from Z-100 in New York City to KIIS FM in Los Angeles. With his natural quick wit and charm, Johnny has joined the ranks of other comedians by performing stand-up at popular comedy clubs like Caroline’s in Manhattan, Mohegan Sun in Connecticut, and the Borgata and Caesars Palace in Atlantic City, New Jersey. Johnny has shared the stage with many of the top acts in comedy such as Andrew Dice Clay, Mario Cantone, George Wallace, Jay Mohr, Tommy Davidson, Martin Lawrence, Colin Quinn, Paul Rodriguez, Caroline Rhea, Dom Irrera, Richard Jeni, Bobby Slayton, David Alan Grier, and Jerry Seinfeld. His comedic sense brought him success in other entertainment genres as well, and he co-created the television show “Let’s Get Stupid” and sold it to Telepictures. 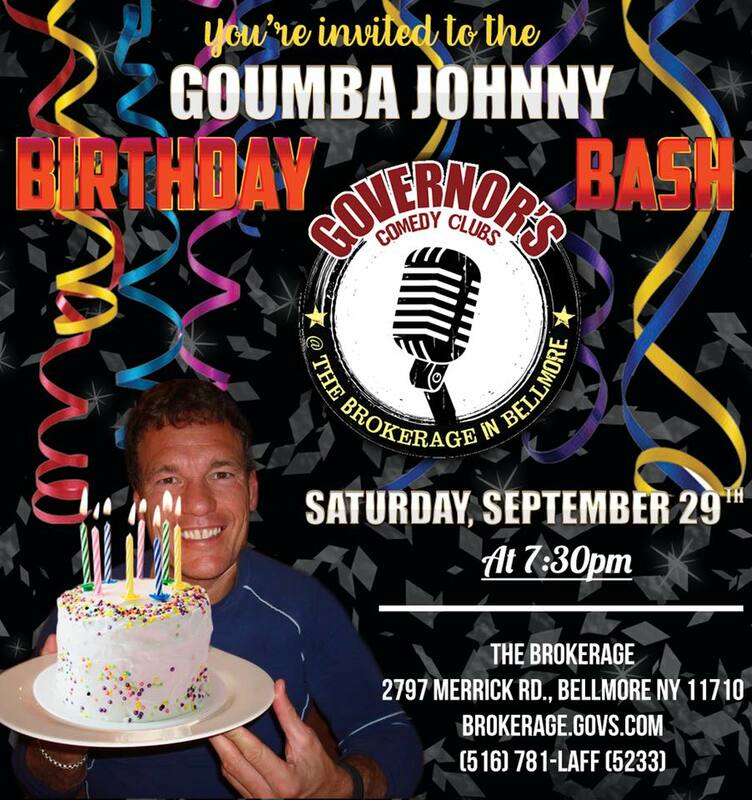 Goumba Johnny has appeared on various television shows such asGrowing Up Gotti, The Weakest Link, The Montel Williams Show, Tough Crowd with Colin Quinn, The CBS Early Show, The Ricki Lake show, The Queen Latifah Show, Who Wants to be a Millionaire, Metro TV/Naked New York and Court TV. In the past Johnny has written for the popular national magazine Cosmopolitan; contributed to US Weekly – Fashion Police for 3 years, and he currently contributes weekly to national magazine Star in Style Stalkers. He has also hit the soap opera circuit landing roles on two popular CBS shows; Guiding Light and As the World Turns. The summer of 2001 Johnny made his New York theater debut in the Strawberry One- Act Festival, portraying ‘Stanley the Bartender’ in the play A Punch in the Face, and the summer of 2002 he had a recurring role as ‘Paulie’ in the hit Off Broadway play Six Goumbas and a Wannabe. In 2003 Johnny starred in his own comedy special, Goumba Johnny’s Slice of Italian Comedy and in early 2004 it has appeared as a special on Pay-Per-View for Direct TV, Time Warner Cable and Cablevision, continuing to gain fans not only in the New York Tri-state area, but nationwide. This comedy special is now available on DVD. In March 2008, Johnny penned his first book –So You Wanna Be a Mobster: Get Made! Get Paid! Get Babes! Start Your Own Mafia Family! (Citadel Publishing), the ultimate comedic self-help yourself book on how to start your own mafia family. Recently, the legendary Friars Club crowned Goumba Johnny the champ of the nationwide contest… So You Think You Can Roast!? Winning the opportunity to roast Matt Lauer. This is the first year the Friars Club hosted a nationwide contest to find the best talent to participate in one of the club’s long-standing traditions. In Johnny’s free time his efforts are donated to dozens of charitable organizations within the tri-state area where he has worked tirelessly to raise countless dollars. He performs stand-up, host’s events, plays softball, bowls, whatever it takes to help the cause raise the most money for their foundation. In 2002 he was appointed to the Board of Directors for the Cooley’s Anemia Foundation, where he was previously honored for his charitable work. He continues to help annually with organizations such as TheBowery Rescue Mission, the Autism Foundation, The Elizabeth Fund for Lupus and many police organizations, as well as many others. brought him out from behind the pen and paper and put him behind the mic. Goumba Johnny was so successful as a co-host in the evening slot that the KTU executives made him co-host of their Morning Show. Goumba Johnny is now heard on in the afternoons on KTU! Tune in every Monday- Friday from 3pm-7pm for the “Hollywood Hamilton and Goumba Johnny” Show.